When you decide to buy or sell a home, you want someone to work with who will be focused on your particular needs. It is also especially wonderful if you can find someone who is approachable, friendly, trustworthy and will "hold your hand" through every step of the way. 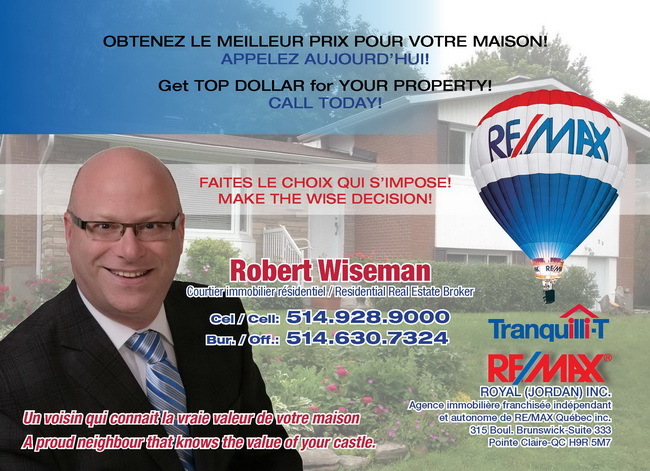 Robert Wiseman is a residential real estate broker with RE/MAX Royal (Jordan) Inc. Since he has grown up on the West Island, he has over 40 years of experience and knowledge of the West Island in order to be able help with a home in any neighborhood there. He can help you buy, sell or rent residential homes, condos duplexes, triplexes and 4plexes. - can recommend movers, renovators, foundation specialists, inspectors, notaries, painters, roofers, etc. - working with this REMAX broker you are covered by Tranquilli-T Insurance at no extra charge. If problems arise with the sale, this insurance takes over. It covers: delay or withdrawal by the buyer or seller, death of the buyer or his/her spouse. It includes free legal consultation as well as legal coverage. Within twelve months after signing the deed of sale at the notary's office, if you should have a question, or if you have found a hidden defect, you have access to various resources in order to reach a favorable settlement. In the event that legal procedures become necessary, legal fees will be covered up to $5,000 per incident, up to a maximum of $10,000. Robert Wiseman always takes time to stay in touch with his clients. You get constant updates. You feel very coddled with his hands on approach to your real estate transaction.